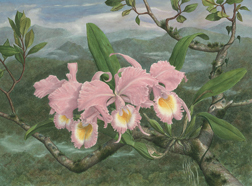 There is likely no more important subject to orchid growers than pest and disease control. Many new hobbyists lose orchids to both before realizing there was a problem. Typically, by March, problems in your growing area manifest themselves because orchids are crowded together in cold windows and greenhouses. This provides the ideal environment for disease and pests to spread from plant to plant. I often get numerous inquiries asking what I use to combat pests of various kinds and disease. My reluctance to specify any given pesticide or product is not because of the fear of a lawsuit, but because there are so many variables that go into a successful control program. There are, however, some general products and approaches that have worked well for me, and are worth sharing. There are also cautions. The first and most important rule is good sanitation, which includes adequate air movement, maintenance of appropriate temperature and humidity, and the removal of dead or infested plant tissues. Air needs to be exchanged with fresh outside air to lower bacterial and fungal spore levels. Indoor hobbyists may have the same problem when their growing area is semi-enclosed. These steps alone solve at least half of the potential bacteria/fungal problems. Botrytis, black spots on flowers, is a common problem in winter or in overly humid greenhouses. This is rarely a problem when there is good air movement or when night temperatures are above 65 F. Once Botrytis appears in a greenhouse it can be difficult to eliminate. It can be done, however. First, remove all dead tissues from benches, floors, and plants. Flowers with these black spots will also need to be removed. Spray walkways, benches and other non-living surfaces with Physan or another agent that kills bacteria at the recommended dose. Note that there are usually two different Physan mixing formulas, one for orchid applications and one for sterilizing non-living surfaces. Some growers use a 10% Clorox solution to kill bacteria on non-living surfaces. The next step is to kill the spores that are hiding on plants. One of the best products is an old copper based product called Kocide. It is relatively inexpensive, but not always readily available for the hobbyist. Apply at the recommended level to all plants, but not on flowers. It will leave a blue sheen on leaves. It also has the added benefit of inhibiting slugs as copper is deadly to them and they will not cross a leaf covered with this product. The next step is very important. Increase air movement beyond what you had before. Every flower in the greenhouse needs to move in the breeze you create. Never water if there is even the slightest chance that the day will be cloudy. Remove any water remaining on leaves before nightfall. If new spots appear, apply hydrogen peroxide. This is the same concentration used for cleaning a wound and can be purchased at any drug store. Dab the infected area with a cotton ball or remove the flower. If more spots appear, then air movement is not adequate or night temperatures are below 65 F.
Fungi also prefer moist conditions and respond to the same control measures. All four of these products (Clorox, Physan, Kocide, and Hydrogen Peroxide) have been around for a long time, which gives me some confidence that there are few unknown side effects. They are all dangerous poisons and I treat each as if it was the most toxic product on the planet and wear protective gloves, respirator, and clothing. It never hurts to be over cautious. Be especially careful when preparing the Kocide solution as the fine powder can easily become airborne and inhaled.